The Marin, CA home care team at Hired Hands Homecare understands that incontinence, or problems with bladder control, is an embarrassing and sensitive matter, particularly for older individuals. 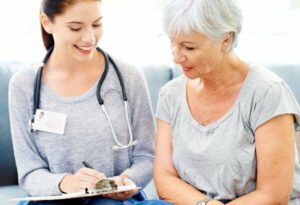 It can trigger a variety of concerns, from skin sores to reduced socialization for seniors who are reluctant to leave the home in case of an “accident.” And yet while urinary incontinence impacts approximately 25 million people in the U.S., the affliction hardly ever gets the attention and conversation it deserves. Considering the lack of communication and facts about senior incontinence, many older adults and care providers feel as though there isn’t anything that can be done to help. Nevertheless, senior incontinence is not inescapable as people age. While many seniors do find that their bladder may be “weak,” leading to leakage, sometimes the issue has a simple solution. If you think your loved one has a UTI, the senior should be checked out by his or her doctor and have the urine tested. Once the infection has been addressed, the incontinence should be resolved or minimized. As mobility is reduced, urinary incontinence can turn out to be an issue. The need to urinate may come on unexpectedly and your loved one may not be able to get to the bathroom fast enough. This may also be an issue through the night, as it often takes longer to get out of bed to go to the bathroom, and awakening in the middle of the night might also cause some confusion. For seniors with mobility concerns, an in-home assessment from one of our Marin CA home care experts can help with providing recommendations. Certain medications, such as diuretics, increase the amount of urine produced, contributing to an increased need to urinate. If your senior loved one is on a medication that increases urine production, it is important to keep this in mind if the person must leave the house or is not in the vicinity of a readily accessible bathroom. At Hired Hands Homecare, our Marin CA home care experts understand how UTIs, senior incontinence, and other senior health concerns can affect quality of life. Our highly trained in home care staff provides a variety of home care services, including transfer and toileting assistance, medication reminders, and bathing and grooming assistance, to help your senior loved one live his or her best life. Contact us today at (866) 940-4343 to learn more about our expert in home care services.